San Diego Landscape Designer Steve Harbour Offers the best in affordable residential Garden and Outdoor Design. Ready to begin your dream landscape? ​San Diego landscape designer Steve Harbour provides the best in affordable landscape design and consulting services to residential clients. With over 35 years experience, Steve continues to be at the forefront in developing beautiful residential gardens and practical outdoor entertainment spaces for San Diego County homeowners. Steve Harbour is one of a only handful of Certified Landscape Designers working in San Diego County. The Certified Designer classification is the highest category of professionalism recognized by the International Association of Professional Landscape Designers (APLD). Steve’s thoughtful, unique landscapes have garnered much acclaim and many awards. Notably, he has also worked as a ISA Certified Arborist and CAN California Certified Nurseryman in the past. Steve is also a published author and photographer. Most recently, 30 photos of 15 of his landscapes were included in the 2016 release: ​Water-smart Gardening by Diana Maranhoe. Every landscape is unique – a combination of art and architecture. No two homeowners have the same goals for their outdoor space. Therefore no two landscapes should ever be the same. We design custom outdoor spaces that reflect the personality of each homeowner. Individual themes vary from contemporary to romantic-era Mediterranean, Mission, or Hacienda, but landscape designs are always seamlessly tied to the home style with a masterful eco-friendly and water-wise, yet inviting plant palette. The finished product is a rich, inviting landscape for spending lots of time enjoying the outdoors. After all, this is San Diego, arguably the best city in country to spend some time outdoors every day. The goal of our design process is to give you -- the homeowner -- the opportunity to have your own unique space to relax and entertain. ​ We begin with a landscape design consultation -- by telephone -- to discuss your project. We then meet for an on-site consultation, at your residence or the site of the project, for a complete, in-person consultation. Possibly a consultation is all you will need. This is a good alternative for do-it-yourselfers. This on-site consultation typically lasts one hour or more, and we discuss everything from plant health and existing conditions to your dream lists of landscape features. For some clients, one or more consultations is the key in beginning a successful landscape renovation. Lists of suggested plants, sketches of small-scale plant layout, and schedules of maintenance requirements can be discussed and created during initial or follow-up consultation visits. Consultations are charged by the hour. Once the on-site consultation is complete, those clients wanting to move forward with a design will receive a landscape design proposal detailing the design work to be done and the type of landscape plans to be created. Landscape design packages are available for new homes or existing landscapes in need of renovation. Designs of full properties are typically desired, but front-yard or backyard-only landscape designs are welcome as well. No space is too small to tackle; all designs get the utmost attention and care. Moving forward with the landscape plan, the first step is another site visit to measure, photograph, and study the area to be landscaped. Then a scaled base-map is created. Once the base map is complete, the designing begins with major softscape and hardscape features positioned and plotted. A client meeting is typically necessary on more complex projects once the preliminary plan is completed. Then it’s on to the complete landscape plan, detailing everything listed in the design proposal. Once complete - we now have a working plan. Once again, a meeting is set to show and discuss the completed plan. One or more revisions are sometimes, though not always, needed after the presentation meeting. This is the prerogative of the client. Once the final plan, it is ready to be estimated by landscape contractors and, after a bid is accepted, the project begins. The designer is not done yet and is available to oversee the project as it is being completed. * Mediterranean, Sub-Tropical & Southwestern Landscapes. * Hacienda, Mission, and Desert, Landscapes. * California Style: Native, Mission, Craftsman, Santa Barbara. * Spiritual: Zen, Meditation, Sanctuary Gardens. * Water-wise, Low-Maintenance, Zeric Design. * Outdoor Rooms & Living Spaces. * Creative Hardscape: Stone, Tile, Wood, Iron, Concrete, Gravel. * Low Voltage – Accent Lighting Design. * Creative Water Feature Design, including Pool & Spa . * Highly visual, client-friendly landscape drawings. * Green’ and environmentally friendly landscapes. * Project Management & Installation. * Garden Analysis, Advice, and Coaching. ​​ Award-winning landscape designer Steve Harbour has developed many notable residential landscapes in the San Diego area. His designs are dynamic, artistic, and structurally-sound works of beauty. 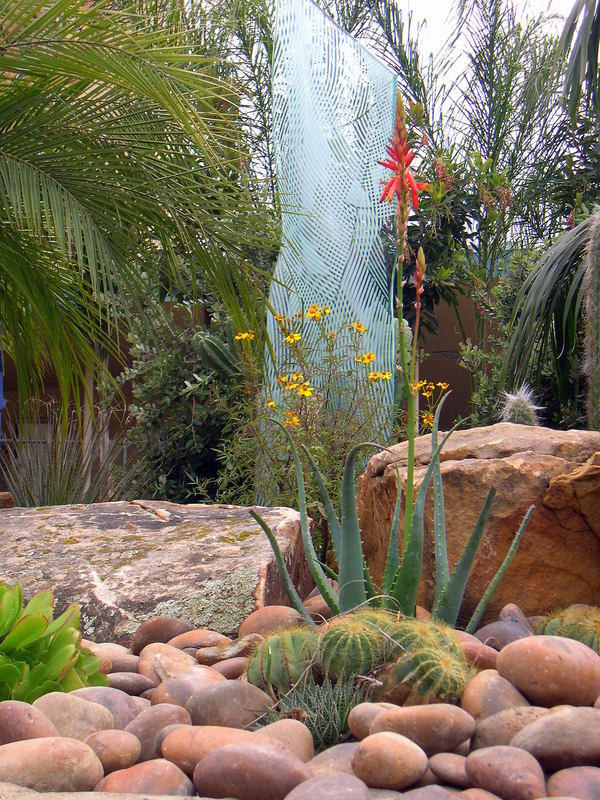 Steve's drought-tolerant, San Diego-esque landscape design surrounds a custom glass sculpture in Del Mar, CA.